Fuel pressure, engine vacuum, cylinder compression, and hydraulic brake pressure are things that all vehicles need to run/stop properly. 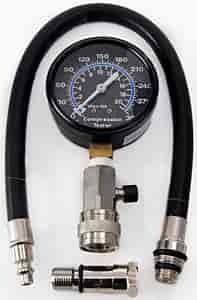 Actron's vacuum and pressure testers can help you perform one-person brake bleeding and quickly diagnose fuel delivery systems, vacuum-operated components, intake and exhaust valves, piston rings, and head gaskets. Whether you use them as a companion to Actron Scan Tools and Code Scanners or to "test and tune" an older vehicle, these vacuum and pressure tools allow you to isolate faults and gauge the condition of critical engine and brake systems.